I am a huge chocolate chip cookie fan. When I was eating a gluten-free diet, I had to find a way to get my chocolate chip cookie fix. 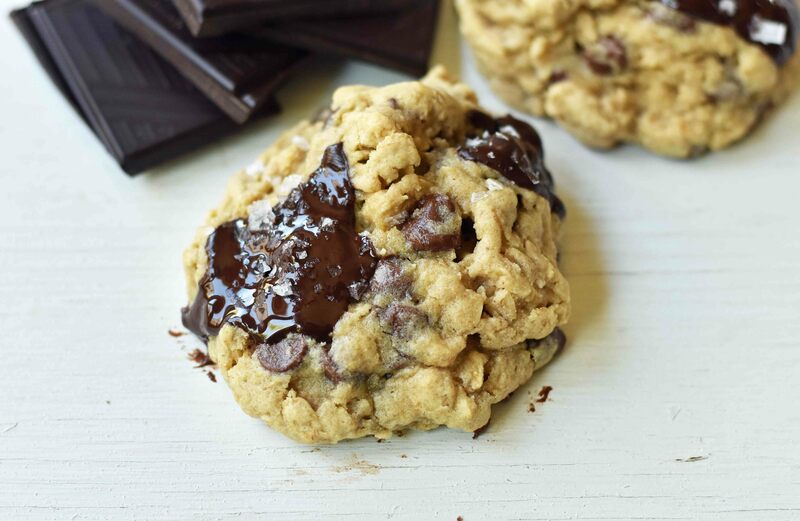 I had to create a soft and chewy gluten-free chocolate chip cookie that actually tasted like the classic chocolate chip cookie. 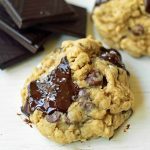 I am sharing all of my tips and tricks for creating the perfect gluten-free chocolate chip oatmeal cookie. I have so many friends and readers who deal with food allergies. They have been requesting for more gluten-free recipes so I tested and re-tested these gluten-free cookies to make sure they were perfect. My family and kids love these cookies and they would never know they are gluten-free! One of my best friends, Maggie, has celiac disease and is on a strict gluten-free diet. She’s always begging me to create gluten-free baked good recipes for her! When I first met her over 12 years ago, I had never even heard of celiac disease. Trying to find gluten-free products was so difficult for her as it wasn’t a well-known issue. Nowadays, there are millions of people who suffer from food allergies or food intolerances and thankfully there are so many products readily available in the grocery store aisles. Gluten, which can be found in wheat, is one of the most common food allergies. What is an allergy? It is a damaging immune response by the body to a substance — a particular food, pollen, or dust, to which it has become hypersensitive. If you have a gluten food allergy, you may have similar symptoms as outdoor allergies. Some of the symptoms may include hives and rash, nasal congestion, irritation of your mouth and throat, eye irritation and swelling, and nausea. No fun! Just by removing the allergen, gluten, from the diet, can completely wipe away those pesky allergic reactions. In my quest to create the ultimate gluten-free cookie, I went to the health food section of my local Fry’s grocery store. There were several gluten-free flour choices so I decided to purchase a few of them to test them out. Years ago, you used to have to make a gluten-free flour blend by hand combining five different types of flours but now all of the work is done for us! There are several well-known brands such as Bob’s Red Mill, King Arthur, Pillsbury, Glutino, Arrowhead Mills, Cup4Cup, Krusteaz, and Namaste. You can find all of them at Wellness Your Way Website. The key to using gluten-free flours in baking is that you need to add a binder such as xantham gum. It is a crazy name but it works brilliantly in gluten-free baked goods. It looks very similar to baking soda. It is essential to making sure the cookies stay together and don’t crumble. Many of these gluten-free flour mixes contain xantham gum already. If they don’t, you can add it to the cookies. 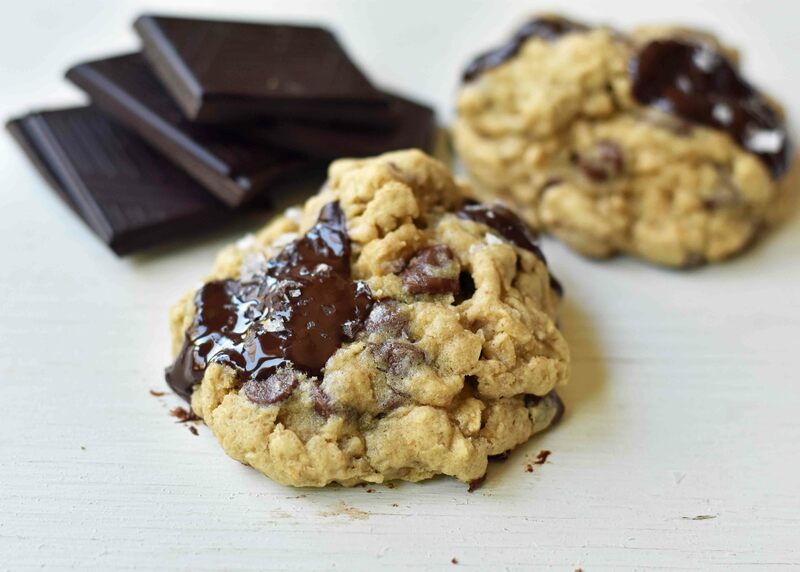 When I make gluten-free cookies, I love to use a mixture of dark chocolate chunks, cut from a high-quality chocolate bar, and semi-sweet chocolate chips. 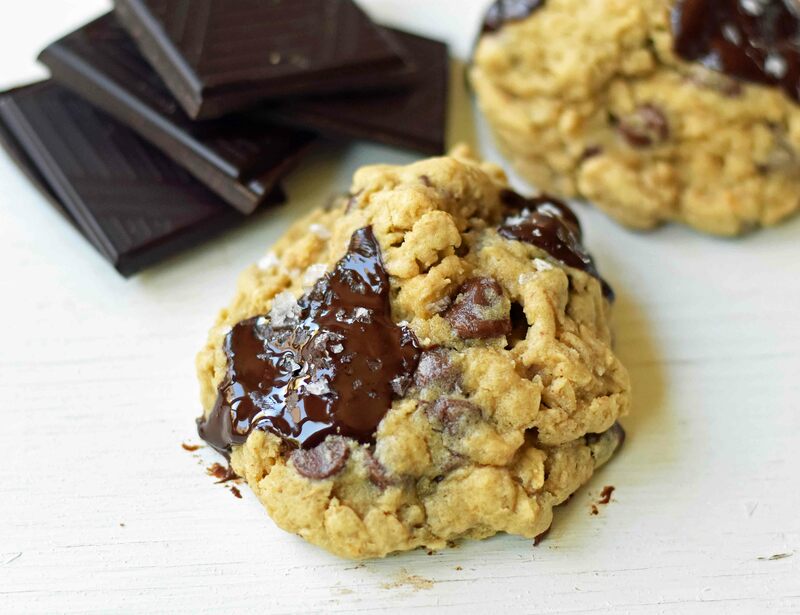 Chocolate chips are meant to hold their shape but chocolate bars melt so beautifully and give off a gorgeous sheen. I used the Private Selection 72% Dark Chocolate Cacao Swiss Bar and chopped it up. We all hear how dark chocolate is good for you so here’s to less guilt! After I place the cookie dough on the baking sheets, I will place the chocolate bar chunks on the very top so when the cookies go into the oven, the melted chocolate bar becomes the star. Cream Butter and Sugars for 4 minutes until light and fluffy. The ratio of brown sugar to sugar is 2 to 1. This helps to create a chewy cookie. The sugar helps to make those crisp edges while the brown sugar makes it chewy. Creaming is another important step as it reduces the graininess while whipping air into the dough which helps the cookies to rise. Add Egg Yolk and Egg. The egg yolk is what adds richness and helps to create a chewy texture. Use a high-quality Gluten-Free Flour Blend. There are many options out there. If you don’t want to buy xantham gum, which helps to bind the cookies together, purchase a gluten-free flour that contains xantham gum. Check the label to see if it is included. Add Gluten-Free Rolled Oats. 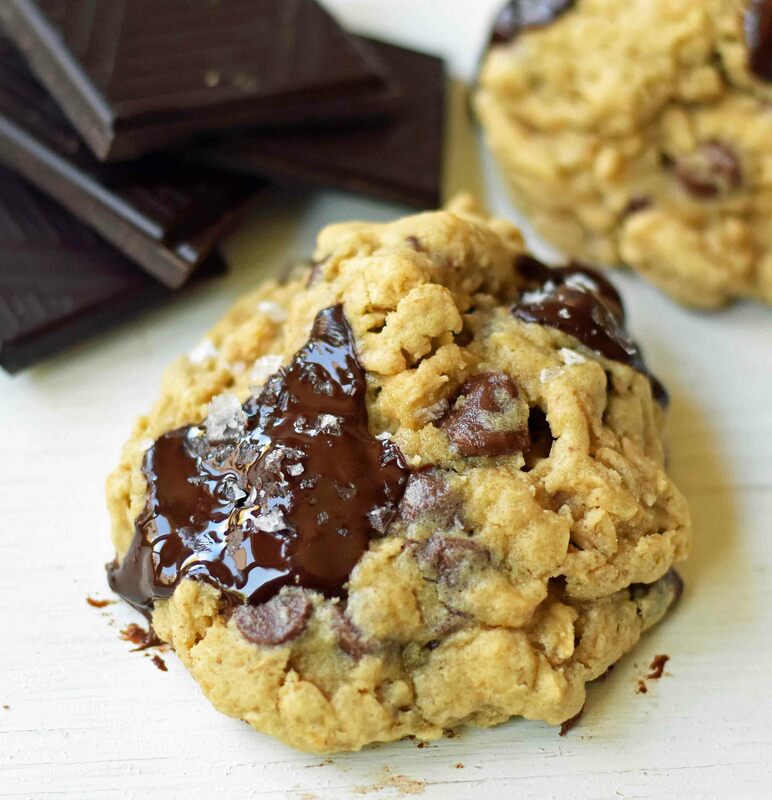 Adding oats to these cookies gives heartiness, a chewy texture, and extra nutrition. Chill your dough. We all know things get better with time — especially cookie dough. If you can wait, let chill for 24-48 hours. If you can’t wait, 30 minutes of chill time will suffice. Tightly wrap your cookie dough to make sure it doesn’t dry out. Bake just until edges become lightly golden. DO NOT OVERBAKE. The cookies will continue to bake for several minutes after removing from oven. I have had so many people request gluten-free baked goods recipes so I will start sharing them more often. I know many of you suffer from food allergies so I want to make it easy for you to create homemade gluten-free cookies at home. If you are looking for more gluten-free cookie recipes, you will love this Flourless Chocolate Brownie Gluten-Free Cookies recipe. If you are looking for a healthy gluten-free and dairy-free pancake recipe, you can find my popular Banana Oatmeal Pancakes recipe HERE. In a large mixing bowl, cream together butter, brown sugar, and sugar for 4 minutes until light and fluffy. Add egg, egg yolk, and vanilla and cream for 1 minute. Stir in gluten-free flour blend, oats, baking soda, baking powder, salt. Add xantham gum if needed. Chill for at least 30 minutes. 24-48 hours is ideal. Drop cookie dough on baking sheet. Bake for 9-12 minutes. *If you want cookies to be thinner, let the dough come to room temperature. You may also remove the baking sheet halfway through baking time, and slap baking sheet on the counter to flatten cookies. You can find all of these gluten-free products plus wellness tips and recipes on the Wellness Your Way website. 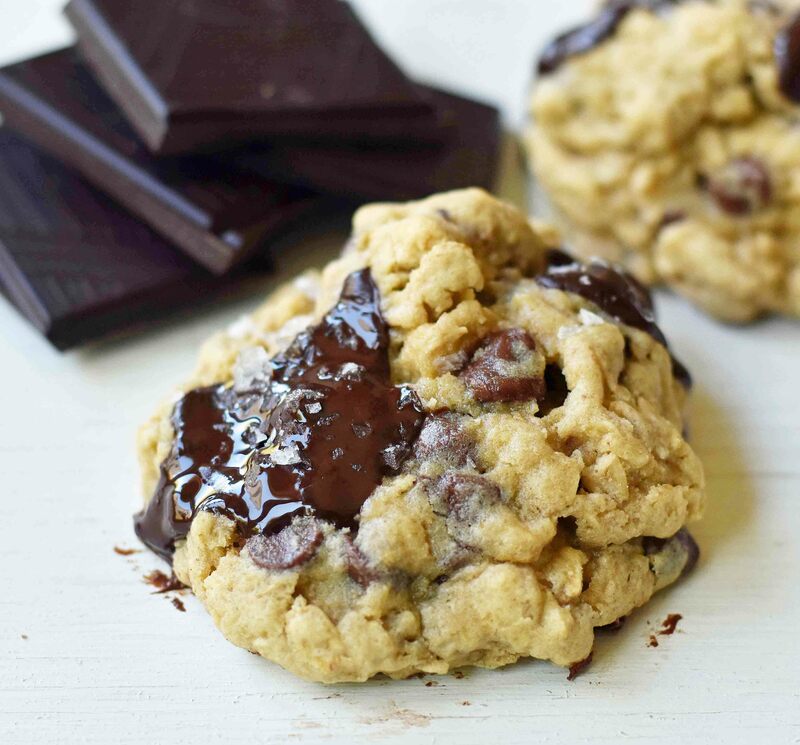 I hope you love these gluten-free chocolate chip oatmeal cookies. Find me on instagram at modern_honey and let me know what you think of the cookies. Have you made any Keto or low carb cookies before? Do you have a non-oat version of this? I’m looking for a gluten free levain-style recipe! Couldn’t you omit the oats and add the equivalent of gluten free flour? Omg I just tried this recipe for the first time. The dough texture seems very promising. I subbed stevia for white sugar bc I don’t have white sugar on hand. I just tasted the finished product. 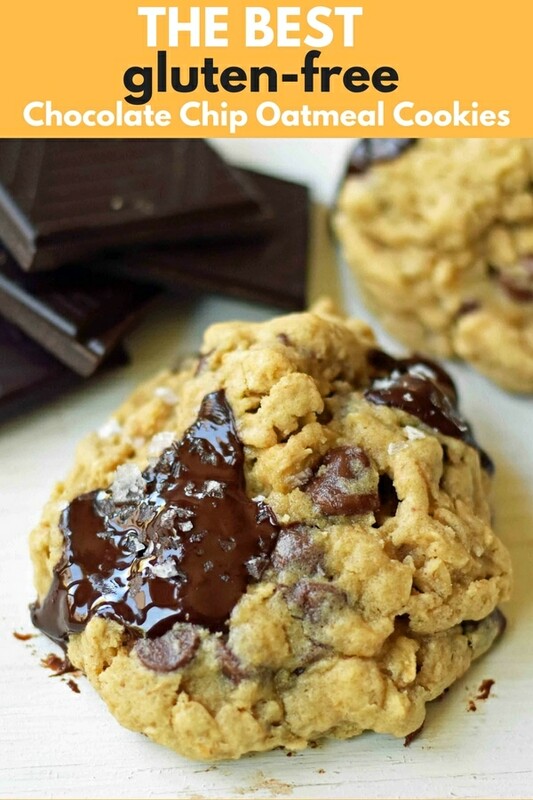 This is the BEST gluten free chocolate chip cookie recipe ever. THANK YOU! I’ve been dying to try this recipe and today is finally the day! I only made a few changes. I used 7 of the Intense Dark Ghiradelli 72% squares, chopped they were about 1/2 cup and 1.5 cups semisweet Nestle morsels. I only refrigerate the dough for 25 minutes. I used a small scoop and rolled each in sugar before baking. I think this is why my cookies spread s lot. A big TWO THUMBS UP they are delicious! Incidentally they are about 9 Weight Watchers SP each if you get 36 cookies. I hope others enjoy these cookies as much as I will. OMG!!! The best gluten free cookies! I didn’t tell my family they were gluten free and we were all in agreement that these cookies are amazing and have the most delicious taste to them! I refrigerated mine for 36 hours before baking. AMAZING!! Thank you for all your wonderful recipes. This is only one of the many I have tried and honestly, they have all been delicious!! I have become a regular visitor to your website! I have tested so many of your recipes and not a single one has disappointed! I am especially fond of your cookie recipes. The notes that you provide have taught me a great deal. I feel like my baking skills have gone to a new level, thanks to you! This week I tried my first ever batch of GF cookies. I took your GF oatmeal chocolate chip cookie recipe and gave it a whirl. I need to share with you that of all the countless batches of your cookies that I have made, I have never altered your recipe. I trust your taste! However, I did make one alteration with this GF recipe. I made the dough with brown butter. Ever since being introduced to brown butter cookies (thanks to you), my whole family is hooked. I asked one of my son’s (home for spring break) to taste test for me. After he inhaled the cookie, he said it was awesome! I told him that it was GF and he said he couldn’t tell. I am a huge fan of your site, Melissa! I look forward to trying even more recipes. Your passion is evident in your attention to detail. Thank you! You make me look really talented!